Mortgage markets moved across a wide range last week before, ultimately, finishing unchanged. The bailout of Greece both dominated headlines and dictated market direction. It was a wild ride for rate shoppers. Early in the week, mortgage rates spiked. Eurozone leaders expressed optimism that a deal for Greece’s solvency would be made, rhetoric to which Wall Street responded selling mortgage bonds. When markets closed Wednesday, conforming mortgage rates in California were at their highest levels since September. However, when markets opened Thursday, rates began to reverse lower. Investors deemed the details of the Greece fuzzy, and, once again, sought safety in the U.S. mortgage bond market. 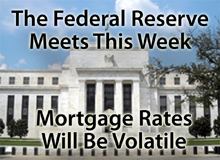 As such, rates fell through Friday afternoon, closing the week precisely where they started. This week’s market action figures to be similarly busy. In addition to Friday’s release of the October Non-Farm Payrolls data, the Federal Open Market Committee starts a 2-day meeting Tuesday. It’s the FOMC’s 7th scheduled meeting of the year. The FOMC is the Federal Reserve’s monetary policy-setting group. It does not set mortgage rates for citizens of Coto de Caza , but it can exert an influence. For example, if the FOMC votes to increase the size of its Operation Twist, mortgage rates may respond favorably, causing rates to fall. Conversely, if the FOMC scales back the size of its program because of inflationary concerns or otherwise, mortgage rates should rise. The Federal Open Market Committee meeting ends at 2:15 PM ET Wednesday and mortgage rates are typically volatile in the hours surrounding the group’s adjournment. If you’re floating a mortgage rate or deciding whether to lock, keep this date and time in mind. For home buyers and sellers in Trabuco Canyon , though, regional data remains too broad to be useful. Housing markets are local, meaning that each block on each street on each city has its own distinct economy. When 9 states are grouped into a single “region”, it’s neither helpful nor relevant to people making buy/sell decisions. According to data from the Census Bureau, the number of new homes sold in September jumped 6 percent from the month prior, beating analyst expectations. On a seasonally-adjusted, annualized basis, buyers in California and nationwide closed on 313,000 newly-built homes last month. For buyers in Coto de Caza , this could be construed as a housing market-shifting signal. As builder confidence rises, it becomes more difficult to negotiate for upgrades and price reductions on a new home. “Great deals” get scarce. As home buyers and sellers in Trabuco Canyon , though, we have to remember that the Case-Shiller Index is a flawed product; its methodology too narrow to be the final word for housing markets. 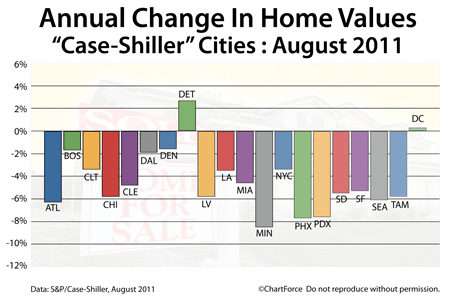 As a monthly release, the Case-Shiller Index does more to help people with a long-term view of housing, including politicians and economists, than it does for everyday buyers and sellers of South Orange County who negotiate prices based on current demand and supply. With average, 30-year fixed rate mortgages still hovering near 4.000 percent, there are more than a million homeowners in Rancho Santa Margarita and nationwide who stand to benefit from the program overhaul. Mortgage markets improved last week on worries that Eurozone leaders would decline to send aid to Greece. These concerns overshadowed optimism for the U.S. economy, the result of several strong data points. Conforming rates across California eased, giving homeowners and rate shoppers yet another chance to nab historically-low mortgage rates. 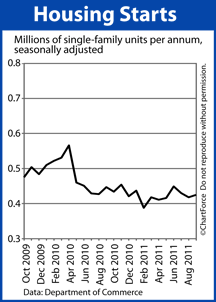 FHA mortgage rates remained low, too. According to Freddie Mac, the average 30-year fixed rate mortgage rate is now 4.11% with 0.8 discount points. For loans with zero points, expect to pay slightly higher rates. Rate-shoppers and home buyers would do well to pay attention. This week’s may be as good as mortgage rates get. Possibly forever. This is because the market conditions that helped rates stay low — a weak U.S. economy and uncertainty in Europe — are eroding. The U.S. economy has posted strong jobs, spending, and confidence figures in the past 3 weeks and Eurozone leaders appear closing making a deal that will help Greece avoid a sovereign debt default. Once markets no longer worry about these two events, rates are expected to surge. 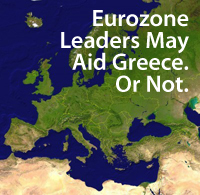 Eurozone leads met all weekend and have chosen Wednesday, October 26, as a likely “decision date” for Greece. If that date holds, and if an agreement can be reached, U.S. mortgage bonds will sell-off and mortgage rates will rise. The housing sector is set to release important news this week, too. After last month’s increase in Housing Starts and steady Existing Home Sales report, Wall Street will watch for this week’s New Home Sales, Case-Shiller Index and Pending Home Sales Index. If momentum stays strong for housing, that, too, should pressure mortgage rates higher. Mortgage rates remain near all-time lows. If you’ve yet to lock your mortgage rate, or are still shopping, consider that rates have more room to rise than to fall. The “safe play” is to execute a lock today. Today’s Trabuco Canyon market exemplifies Supply and Demand. 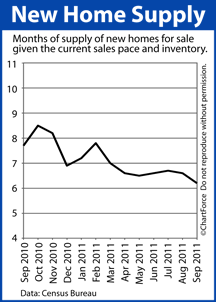 Demand for homes is holding steady as home inventories fall. This creates pressure for home buyers to make offers, and multiple bidding situations become more common. Negotiation leverage shifts to the sellers and the result is that buyers pay higher prices for homes. That’s a good number, but hardly a great one. And for home buyers and sellers throughout Trabuco Canyon and nationwide, it’s the Single-Family Housing Starts that matter most. Individuals like you and I don’t buy entire apartment buildings. Most often, we buy single-family homes. Therefore, that’s the data for which we should watch. Homebuilder confidence is rebounding sharply. Just one month after falling to a multi-month low, the Housing Market Index rebounded four points to 18 for October. 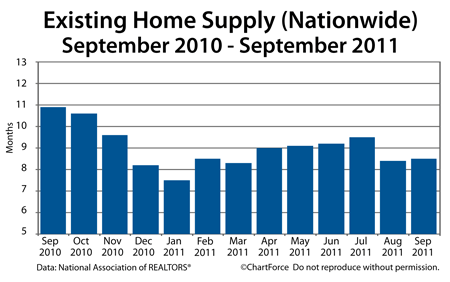 It’s the highest reading for the HMI since May 2010 — the month after last year’s homebuyer tax credit expiration. The Housing Market Index is published monthly by the National Association of Homebuilders and is scored on a scale of 1-100. 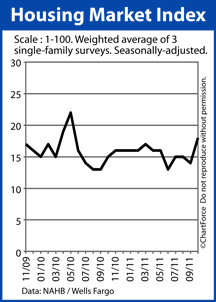 Readings above 50 indicate favorable conditions for homebuilders. Readings below 50 indicate unfavorable conditions. The index has been below 50 since May 2006 — a 66-month streak. The Housing Market Index is a composite reading; the result of three separate surveys sent to home builders each month. Builders are asked about current single-family home sales volume; projected single-family home sales volume over the next 6 months; and current “foot traffic”. Meanwhile, of particular interest to today’s Trabuco Canyon home buyers is that builders expect volume to surge over the next two seasons. And, with current sales volume rising and foot traffic strengthening, the fall and winter months could be strong ones in the new homes market. In addition, the builder trade group press release states that rising costs for materials are squeezing building profit margins. For buyers, it all adds up higher home prices ahead. As builders grow more confident about the housing market, they’re less likely to make concessions on pricing or upgrades. Rising building costs fortify that argument. The “great deal” will be tougher to negotiate. At least mortgage rates are low. Low mortgage rates are keeping homes affordable in California and nationwide. If you’re looking for the right time to buy new construction, therefore, this month may be it. For home buyers in Trabuco Canyon , shopping for foreclosed properties can be an excellent way to get “a deal”. 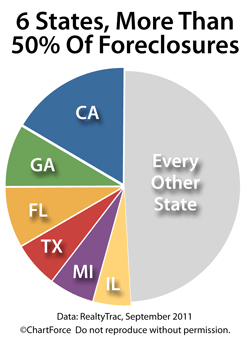 Foreclosed homes typically sell at discounts as compared to “non-foreclosed” homes, but are often sold “as-is”. This means that homes listed for sale may be defective or out-of-code.